We do not currently accept any type of glass. The city has a contract with a glass company that has purple bins located around the city. What kinds of plastics can I recycle? We accept #1 and #2 plastic jugs and bottles. There is no longer a need to separate the clear plastic from the colored plastic. Lids to bottles and jugs can be recycled but please do not tighten the lid as it will burst under the pressure when the plastic is baled. What can I put in the cardboard recycling container? Any type of cardboard box or fiber board (i.e. moving boxes, shoe boxes, cereal boxes, paper bags…). These items must be flattened and all packaging material or gift wrapping removed. What can I do with our old appliances? We take any appliance that is over 50% metal accept for microwaves. The shelves do not need to be removed from items such as refrigerators or dishwashers. We also accept exercise equipment, bicycles, lawn mowers, barbeque grills, swing sets, etc. We DO NOT accept televisions, vacuums, furniture or mattresses. How do I recycle oil and paint? The City of Jefferson currently hosts Hazardous Waste weekend drop-offs twice a year. Time & place would be announced in the local media. They also host a drop-off day for tires as well. A computer tower is taken apart, sorted and recycled in parts. If you would need your hard drive destroyed, we do provide a service that can accomplish that but the hard drive would already need to be removed from the CPU. 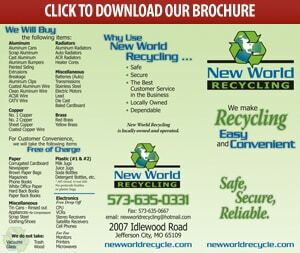 We can also recycle accessories such as keyboards, the mouse, ink cartridges, etc. However, there is a minimal charge for recycling monitors. Can I recycle old windows? Yes and no. We can recycle the metal window frames and screens but any glass must be removed. Note: If all screws are removed from the frames, the metal is considered a higher grade of recyclable as well. Grab a refrigerator magnet. If the magnet does NOT stick to the metal, you most likely have a metal that has monetary value as a recyclable. If the magnet does stick, that metal is most likely steel and can be placed in the appliance bin at our location.